In June 2018, a time when “Agile at Scale” is emblazoned on the front cover of Harvard Business Review (read the original “Agile at Scale” HBR article here), the management journal with quasi-papal status, the era when managers could confidently ridicule agile management practices is fading fast. Instead, most managers have themselves grasped the need to be agile: a recent Deloitte survey of more than 10,000 business and HR leaders across 140 countries revealed that nearly all surveyed respondents (94%) report that “agility and collaboration” are critical to their organization’s success. Yet only 6% say that they are “highly agile today.” So, what’s the problem? Why the 88% gap between aspiration and actuality. …The three Laws of Agile are simple—first, an obsession with continuously adding more value for customers; second, small teams working on small tasks in short iterative work cycles delivering value to customers; and third, coordinating work in a fluid, interactive network. …The Laws of Agile are simple but their implementation is often difficult. That’s in part because they are at odds with some of the basic assumptions and attitudes that have prevailed in managing large organizations for at least a century. For example, Agile makes more money by not focusing on making money. In Agile, control is enhanced by letting go of control. Agile leaders act more like gardeners than commanders. And that’s just the beginning. Yet let’s face it: setting aside what many still see as an immutable truths of the universe doesn’t come easily. Similarly, Microsoft for many years saw the customers of its Windows program as the big retailers like Dell and HP. More recently, they have come to realize that their customer is really the end-user, not these intermediaries: there is now an immense effort to reach out to, undestand and interact with these millions of end-users. The 20th Century firm tended to be focused on generic products to achieve economies of scale. By contrast, Agile is about generating instant, intimate, frictionless incremental value at scale. That’s the new performance requirement. When firms do this, as shown by the experience of Amazon, Apple, Facebook and Google they make a great deal of money. Control Is Enhanced By Letting Go Of Control. Traditional managers typically approach Agile saying, “Show me the process so that I can implement it.” The problem is that Agile is a mindset, not a process. If it is approached as a process with the old mindset, nothing good happens. But surely, people ask, there must be some model that we can follow. There is much allure for instance in the Spotify model as presented in the charming videos prepared by Henrik Nyberg. So there is a cry: “Let’s implement the Spotify model!” There’s just one problem: as former Spotify coach, Joakim Sundén, often explains, not even Spotify implements the Spotify model. For one thing, the videos are several years old. Second, Spotify continues to rapidly evolve and improve its model. In a pair of visits in 2016, we noticed significant differences even within a period of several months. CAREER TRANSITIONS & Why Would People Consider Quitting Their Jobs, Exactly? Gallup Research Sums Up the Entire Reason in 1 Sentence. Commentary by Dr Whitesel: While preparing a new Doctor of Ministry course for Fuller Theological Seminary on interim/transitional pastoral ministry, I am researching why pastors leave churches. The article below throws light on this from the Gallup organization and suggests ways to retain talented leaders. Read the article and then find more insights at this accompanying article: CAREER TRANSITIONS & Why Do Employees Quit Their Managers? Here’s the No. 1 Reason in a Short Sentence. “Why Would People Consider Quitting Their Jobs, Exactly? Gallup Research Sums Up the Entire Reason in 1 Sentence“ by Michael Schwantes, Inc. Magazine, 5/14/18. In 2017, Gallup released the third iteration of their infamous workplace report, the State of the American Workplace. Using data collected from more than 195,600 U.S. employees in 2015 and 2016, Gallup asked employees to indicate how important certain job attributes are when considering whether to jump ship and take another gig with a different organization. The top factor in the minds of most employees across the country? Gallup summarizes it in one sentence: The ability to do what they do best. Sixty percent of employees — male and female of all generations — say the ability to do what they do best in a role is “very important” to them. How do you bring that into fruition? Employees do their best in roles that enable them to showcase and integrate their biggest strengths: talent (the natural capacity for excellence); skills (what they can do); and knowledge (what they know). And companies are leaving money on the table by not recognizing these strengths beyond a job description, and how it all translates to high performance. People love to use their unique talents, skills, and knowledge. But most conventional managers don’t know what those things truly are. The best leaders will leverage close relationships with employees by finding out what their strengths are, and bringing out the best in their employees. May 14, 2018 by bobwhitesel	Categories: C	| Tags: career, DMin, transition. REFUGEES & Reaching the nations from a small Georgia town. Commentary by Dr. Whitesel: I took my first-year DMin students to “the most diverse square mile in America” (Clarkston, GA) to learn first-hand from my colleague Brian Bollinger and Friends of Refugees. Here is an article about what another church is doing in the area. More than 1,000 refugees come to Clarkston, Ga., each year. Send Relief missionaries Trent and Elizabeth DeLoach and the believers at Clarkston International Bible Church (CIBC) have made it their mission to help these men, women and children feel not only welcome but at home in their new country. A U.S. refugee resettlement program in the 1990s opened the door of opportunity for people from around the world to start a new life in Clarkston. This suburb of Atlanta eventually became known as “the most diverse square mile in America.” More than 60 countries and 100-plus languages are represented, and the population continues to grow. After they married, the DeLoaches moved to Kentucky to work with a church in Louisville. They were astonished that more than 5,000 Bosnian refugees lived in the area. They started “restaurant hopping” and praying for connections. “The different cultures, religions, languages—it was all very intimidating,” DeLoach said. By living next door to families with diverse cultural backgrounds, Elizabeth says they have opportunities to influence the nations. Dodge aired a commercial for its Ram truck series during Sunday’s Super Bowl featuring a portion of a sermon from the Rev. Martin Luther King Jr. that has drawn a backlash on social media. The decision to allow King’s sermon to be used was made by his estate. The ad begins by noting that King delivered the sermon – known as “The Drum Major Instinct” – on Feb. 4, 1968, 50 years ago today. In the same sermon, delivered the same year he was assassinated, King also advised people not to spend too much on cars. According to Stanford University’s reprinting of his sermon, this particular sermon was an adaptation of the 1952 homily ”Drum-Major Instincts” by J. Wallace Hamilton, who was a well-known, white liberal Methodist preacher at the time. … What the Super Bowl ad doesn’t include is the part from King’s sermon where he warns against the dangers of spending too much when buying a car and not trying to keep up with the Joneses. DMIN & Wesley Seminary cohort in Transformational Leadership began their educational journey visiting #MLK birthplace, Ebenezer Baptist Church & Greater Traveler’s Rest Church where #MLK pastored. Commentary by Prof. B: Below are two pictures from the first course I taught to our DMin in Transformational Leadership students. 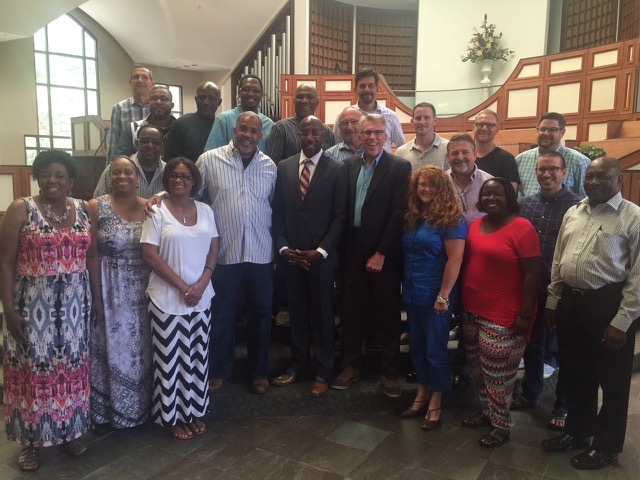 The course (LEAD 711: Foundations of Urban, Rural and Suburban Leadership) included visits to important #MLK historical sites as well as hearing from a diverse group of pastors. The first is a picture of our #WesleySem #DMIN #Leadership cohort visiting #MLK birthplace and hearing from @Ebenezer_ATL Church pastor #RaphaelWarnock. I was asked by Fuller Theological Seminary, my alma mater from which I earned three degrees (M.Div., D.Min., Ph.D.), to explain to doctoral students how I was able to write four books and contribute a chapter to another during my Ph.D. work. Here is the video explanation that might be helpful to any current D.Min or Ph.D. students wishing to share the insights they are learning.